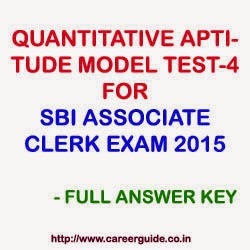 Here we have published 15 MCQs (Multiple Choice Questions) with answer key of Quantitative Aptitude/ Numerical Ability for SBI Associate Banks Clerk/ Assistant recruitment 2015 online examination. Hope you found it helpful and we wish you all the success for this exam. Directions—(Q. 1 to 5) What approximate value should come in place of the question mark (?) in the following questions ? Q.1. 182•225 ´ 21•652 ´ 33•584 = ? Q.3. 11/7 + 22/3 + 18/5 = ? Q.4. (9%of86) X (6.5%of144) =? Q.5. 9546324 ÷ 4584 = ? Q.6. Three numbers are in the ratio of 3: 4 :5 respectively. If the sum of the first and third numbers is more than the second number by 52, then which will be the largest number? Q.7. The compound interest on a certain amount for 2 years at the rate of 8 p.c.p.a. is Rs.312. What will be the simple interest on the same amount and at the same rate and same time? Q.8. The length of a rectangle exceeds its breadth by 7 ems. If the length is decreased by 4 cm. and the breadth is increased by 3 cms., then the area of the new rectangle will be the same as the area of the original rectangle. What will be the perimeter of the original rectangle? Q.9. The sum of the digits of a two digit number is 12. If the new number formed by reversing the digits is greater than the original number by 54, then what will be the original number? Q.10. In a fraction, twice the numerator is two more than the denominator. If 3 is added to the numerator and the denominator each, then the resultant fraction will be 2/3 .What was the original fraction ? A school has a total of 1200 students. The ratio of girls to boys in the school is 3 : 2. All the students have enrolled in hobby classes viz. Singing, Dancing, Martial Arts and Cooking. One-twelfth of the boys have enrolled in only cooking classes. 25 per cent of the girls have enrolled in Cooking and Singing classes to-gether. Number of boys enrolled in only Martial Arts classes is 150 per cent of the number of girls enrolled in the same. Number of students enrol-led in only Dancing is 26 per cent of the total number of students. 5 per cent of the girls have enrolled in only Martial Arts classes. One-third of the boys enrolled in only Dancing classes. 35 per cent of the girls enrolled in Singing, Dancing and Martial Arts together and the remaining enrolled in only Cooking. 15 percent of the boys enrolled in Cooking and Singing classes together and the remaining enrolled in Singing, Dancing and Martial Arts classes together. Q.11. Number of boys enrolled in Cooking and Singing classes together is what per cent of the girls enrolled in the same? Q.12. What is the total number of students learning Martial Arts? Q.13. How many girls are enrolled in only Cooking classes? Q.14. How many boys learn Singing? Q.15. What is the respective ratio of girls to boys enrolled in only Dancing classes? We have tried our best to present important questions with correct answer key. Any suggestion or update about any erroneous entry or answer is always appreciable. Please comment your score or any suggestion in comment section below.